A campaign of referencing SEA (Search Engine Advertising) or paying or sponsored is efficient from its putting on the way. It is however necessary to make a strategic audit of your presence on the net and an analysis ( SWOT) of your company to launch an efficient campaign Adwords, with a clear objective. What is the sponsored referencing or SEA (search engine advertising) ? 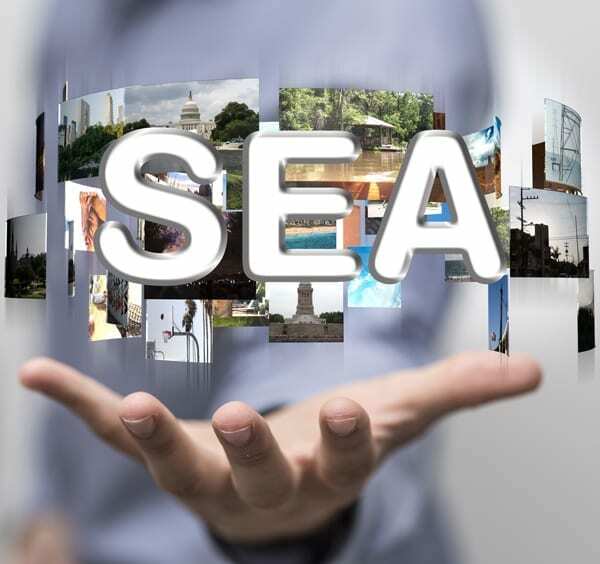 The Search Engine Advertising (SEA) referencing, so named sponsored, or not organic referencing, indicates all the actions to position its site in head in Google by buying sponsored links. It corresponds to all the commercial advertisements been organized on search engines with mainly the commercial referencing Google Adwords.. The goal of the google adwords campaign: generate of the traffic qualified on your website through its sponsored referencing. For it, it is important to make a strategic audit of your positioning on the clear and to define one or several objectives to achieve. - 30 % of visits to a website referenced on Google come from sponsored links. - 70 % come from natural referencing. So it's worth remembering that sponsored keywords complement natural referencing, and that they should both be used. Google AdWords works using a keyword system and essentially uses text format. The program works on a Pay Per Click (PPC) basis, meaning you only pay if someone clicks on your link. Your ranking is determined by both its click-through rate (CTR, relevance) and the amount that you, the advertiser accept to pay for each click (auction). To launch a site in starting up and have a minimum of traffic. To insure you a visibility in an extremely competitive sector. To push at the top of Google one or some very strategic pages which are badly positioned in the natural results. Without any method of natural referencing, thus it is possible to be at the top of Google in inserts planned for that purpose. The results are immediate: you pay and you see your website in the sponsored results Adwords of Google in the minutes which follow on your keywords. You increase the traffic on your website, what indirectly is a positive criterion for the natural referencing or SEO. A campaign Adwords will not favor the natural positioning on these keywords Adwords. On the long term, to use the state control Adwords is expensive (all the more for competitive keywords). We recommend to couple the action adwords with the natural referencing and others actions of traditional communication to optimize the return on investment of your choices AdWords. - The geographical zone of your campaign. - The objective of your campaign (example: attract hot prospects only, recruit massively prospects, sell stocks at promotional price while taking into account your seasonality (sales, periods of overactivity and money activity). - The keywords for which you wish to reveal your announcement. - The editorial staff of your texts of announcement, and the keywords which are associated to it, with the title, both lines of description, the address of the page which appears to the Internet users and the page where they are going to be redirected on your Web site. - We define your maximum budget to be a day spent and the price which you agree to pay for every click of an Internet user on your link. Ask us a cotation ! Follow-up of the referencing SEA: We measure the impact of our optimizations. According to the positioning of your keywords we shall adjust monthly or not the parameters above to optimize your referencing paying for every announcement. We measure the impact of our optimizations: follow-up of the evolution of the number and the quality of the visits on your site and followed by the evolution of your positioning on search engines according to the keywords of the campaign. SEA of the website analyze visits to adjust the sponsored referencing or. The paying or sponsored SEA referencing is not still enough. For certain corporate associations where it became very difficult to obtain the first positions, even front pages of results (for example the restoration, the hotel business, the real estate agencies...). There are other solutions as the natural referencing (SEO), which allows to increase its visibility, its traffic and its fame on Web through the netlinking and other digital tools. Publishing: books, sales reports, company brochures, etc. Advertising: press ads, mailshots, flyers, posters.